Michael McFadyen's Scuba Diving - SS President Coolidge - Salvage Works After the sinking of the SS President Coolidge on 26 October 1942, salvage efforts did not start right away as one might think when it is considered how much equipment was aboard. The first salvage attempt started on 15 January 1943 when the Chief of the Medical Unit on Espiritu Santo, Colonel Arthur G. King, MD, undertook training to dive on the Coolidge in an attempt to retrieve some urgently needed medical supplies, mainly the 519lbs of quinine (an anti-malarial drug - 250,000 doses, the entire reserve supply for the Pacific) that the Coolidge was carrying. However, the dive never went ahead as a mine had broken loose in the area. However, I received an e-mail from Michael A. Jones, Sr who advised me that his father (not sure of his name) was on the Coolidge when she when she sank. Mr Jones told me that his father said that the Navy did recover medical supplies, the mail and other material from the Coolidge. His father told him that they went to the army base and got torches to cut an access in the side of the ship. He said the first man in the hole came out like a torpedo, went to the surface and never returned. They were wearing surface supplied breathing apparatus and he says that he followed the second man in. Dad and the other divers had never used underwater torches before and that in itself put more stress on the boys, as they could only imagine what awaited them on the other side of the hull. I have also been contacted by Paul F Hackett who was stationed in Santo during the War. He advised me in November 2005 that on Sundays he used to go to St Michael's Catholic Church (which is located next to Coral Quays Fish & Dive Resort - ex Bougainville Resort) from Luganville. He told me that along the way they passed a barge which had a crane on it. This was being put together by the Navy to enable salvage of the Coolidge. During the War it has been reported that the US Navy sent some divers down and they apparently removed some items from the front holds, perhaps some ammunition and maybe three artillery guns from the second hold. There is still at least four guns in this hold. Whether this is the same salvage mentioned in the above paragraphs I do not know. Richard P. Toulson of Los Altos, California (see references) was based on Espiritu Santo during 1944 (on flying boats)has told me that his group received salvaged cargo, equipment, Coca Cola from the wreck. As indicated above, at some time the hull over holds two and three is alleged to have been opened by Americans, presumably the Navy. This is reported by Peter Hole, one of the people who later worked on the salvage of the Coolidge's props, in The Lady and the President - The Life and Loss of the S.S. President Coolidge by Peter Stone. However, no time frame is given for this to have occurred and no actual evidence presented. After the war, Reece Discombe, a New Zealander, arrived in Espiritu Santo and dived on the Coolidge. He was possibly the first person to dive on the wreck other than the Navy personnel. During one of these dives he found one of the ship's bells. This was located at the base of the forward mast. It was quite large, 20 inches in size and of course, made of brass. On it is inscribed "SS PRESIDENT COOLIDGE" and "Pacific Brass Oundry [sic] of San Francisco 1940". Apparently some Japanese attempted to gain approval to raise the Coolidge in 1947 but this (thankfully) never happened. On 8 May 1953, Burton Kent Jaquith, a former employee of the Dollar Line, purchased the SS President Coolidge for "US$10.00 and other valuable considerations" (this is a direct quote from Mr Jaquith to me). The Coolidge was part of a package of vessels he purchased. These included the SS Russell Chittenden, a Liberty on Gwadaraba Reef at the Trobriand Islands in Papua New Guinea. It is reported that in 1957 Mr Jaquith arranged for the Miyachi Salvage Company of Kobe, Japan, to salvage the wreck. However, the Government of the New Hebrides (the infamous French-British condominium) refused to permit the salvage. It is not known why this happened, but elsewhere in the world, some salvage was done on other World War II wrecks (the Solomon Islands, Coron in the Philippines, Chuuk Lagoon - very limited). Mr Jaquith did not comment on this to me. In the late 1960s, Australian diver Barry May turned his talents to the Pacific. Barry was originally from Sydney and in the late 1950s it was reported that he never dived without a stick of gelignite (personal comment to MM by Les Caterson). During this time Barry salvaged (or attempted to salvage) various shipwrecks located off Sydney. These included the SS Hilda and the MV Malabar. He and Des Woodley also salvaged wrecks from eastern coast of Victoria around to Edithburgh in South Australia. In 1967 they travelled to New Caledonia to salvage some wrecks. They they spent almost two years raising metals before being told to leave the country. In February 1968, Des Woodley travlled from Noumea to New Hebrides (now called Vanuatu) to investigate whether the SS President Coolidge on the island of Espiritu Santo) had been salvaged. Des was the first Australian to dive on the wreck and confirmed that the props were still there. In late 1968 they moved to Santo with a 45 foot boat Danielle. After apparently doing some preliminary exploration work, they returned to Sydney and purchased the ex-Royal Australian Navy dive vessel Seal and renamed it Pacific Seal. They did some work on the 66 foot vessel and motored to Middleton Reef (an infamous location in the western Pacific where many ships and yachts have come to grief). Here they salvaged the propellers of the largest vessel wrecked there, the TSS Runic and came back to Sydney. They did more repairs to the salvage boat and then travelled to the New Hebrides, leaving Sydney in November 1969. 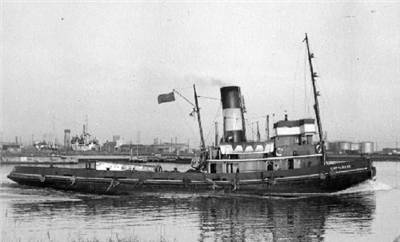 Aboard was Allan Power. He was a young Sydney spearfisher and he came along to take some photographs of the wreck of the SS President Coolidge. The aim of the trip was to salvage the props off the wreck. The props of the Coolidge were made of brass and weighed an estimated 14 tons each. They were about six metres across. Barry May found out who the owner of the wreck was (Burton Jaquith) and wrote him a letter. However, Burt Jacquith advised me in January 2001 that there is no way that he received a properly addressed letter and he does not accept that it would have got lost in the system. Receiving no response, he then spoke to the New Hebrides Government and they expressed no interest in the wreck. Using information from Reece Discombe (who was now working and living in Port Vila, the country's capital), his team located the wreck and started the salvage attempt. Allan Power joined in the work, but he was only employed on a casual basis. The main problem encountered was the depth. The shallower of the two props was the starboard one. This was at 55 metres. The deeper port prop was at 65 metres. Using small 72 cubic foot tanks, without content gauges, meant that they did not have much time on each dive to do the work. This was fairly complex and tiring work. The props were held on the driveshaft by a huge nut which was secured by another nut. The first nut was removed by a dynamite explosion and then another stick was used to loosen the main nut. Then, a special wrench was used but this did not work very well. Barry May then built a wrench which fitted over the nut and had a steel cable which ran around the wrench and up to a point on the propeller blade. Here it was attached to a winch which was used to pull the cable in. As this happened, the wrench turned, loosening the nut. It took one week to remove the nut on the starboard prop. It was finally removed with an explosive charge and another one was used to push the prop off the shaft. The prop was supposed to then swing under the Pacific Seal on cables connected to the prop. However, they were not strong enough and the cables broke and the prop fell to the sand below, 70 metres down. They then attached cables to the salvage vessel and moved it to shallower water where it was placed before being cut up into more manageble pieces. After the starboard prop had been salvaged, May had to go to Sydney to sell some of the metals they had collected. The work continued in his absence and the remaining salvers decided to do the job quickly. These were Bob Delander, Ray Abbott and Reg Thomas. They placed a whole case of dynamite on the prop shaft and blew the prop off. It split into two and fell to the seabed. In addition, the explosion holed the hull at the stern and oil was leaking. The oil escaping was apparently quite considerable and visible on the surface. One blade separated from the hub and other two blades and flew 9 metres and rammed into the sand. It took some time to dig the two props out and lift them. In total, it took four months to salvage the two props. Barry May and Des Woodley moved onto salvaging the USS Tucker, a US destroyer that had sunk at the opposite end of Segond Channel about two and a half months before the President Coolidge sank. Both had hit US mines. They could not salvage the condensors as they weighed 10 tons each. About June 1970, the Pacific Seal (with May and Woodley) then then moved to New Guinea but Allan Power stayed behind. During this time, and some people May left behind continued work on the Coolidge (I think Peter Cole is mentioned in Peter Stone's book - see references - but he was not a diver). They removed four to six prop blades (possibly from Hold Three) each weighing 4.25 to 4.5 tons each. After working in the Solomons (on the Honiara wrecks) and New Guinea, May came back to Santo in 1971and returned to the Coolidge. During this work 50 tons of field gun shells and rifle rounds were removed. Most came from hold three and after removing the explosive, the casings were sent to Australia. They also removed wheels and tyres and sold them to locals. The wheels were useless, sometimes falling apart as soon as they were used, but the tyres were still okay. Rifles from the holds were also taken to the surface but they were corroded. Barry May and his crew entered the engine room but finding a almost four metres of oil in there, they decided not to open it up. The price being paid for used metal dropped around this time so they decided to stop the salvage work and left Santo. Barry May later owned and ran the Cairns dive boat Auriga Bay II which he built in 1976 and as of 2014 lives in Vaucluse overlooking Sydney Harbour. By now oil was leaking from the hull, especially where the salvage work had cracked the hull. Ian Lockley from Fiji purchased the salvage rights from Barry May in 1972. An interesting aside is that Lockley was also involved in the 1986 salvage of parts of the MV Mikhail Lemontov in New Zealand. After many complaints from residents living alongside Segond Channel, the Government asked Lockley's company, Salvage Pacific (Fiji), to quote on removing the oil. The initial job was to survey how much oil was left in the ship. Ian Lockley had an idea for disposing of the oil. To do it, he purchased an old tug from Fiji. This was the Tui Tawate, an old World War II tug of the Empire class, originally named Empire Shirley and a sistership to the Himma which is located off Long Reef in Sydney. The tug only just made it to Santo where it was then converted to hold oil in all its compartments, including crew quarters. It was originally proposed that the oil be burnt in the boilers of the tug and but a better idea came up. It appears that someone then suggested that the oil be used by the cruise vessel, SS Arcadia. The Arcadia regularly visited Santo on her cruises from Sydney. The oil could easily be used by this old ship so the Government arranged for P & O, the owners of the Arcadia, to purchase the oil. The oil was pumped into the Tui Tawate and from there into the Arcadia. Over three visits in 1977 the ship took on board 200 tons of oil at a time and used it in her furnaces. The Tui Tawate now rests in 44 metres of water straight off Bougainville Resort, a few kilometres to the south of Luganville. According to Kevin Green (then owner of Aquamarine), fewer than 10 people had dived it till October 1998. During this month, seven of my friends dived on it (I was ill) and reported that it was a good dive. It is intact. I dived it with Kevin from his private boat in June 2007. After the oil salvage, Ian Lockley stayed on in Santo to do more salvage on the Coolidge. They cut a huge hole on the starboard side above the engine room. This gave access to the huge electric motors and generators, which, off course, contained huge amounts of copper. The condensers were also removed. This work was not proving profitable as much machinery and other items had to be removed to get to the valuable metals. This was the last salvage work done on the wreck. Burt Jaquith has never relinguished the ownership of the SS President Coolidge nor abandoned her. He has told me that as he was not in a position to do the salvage work himself, why should not others benefit from their work, even though it was illegal. He said that the only legal relationship he has relating to the wreck was to grant Alan Power the right to dive and conduct dives on the wreck ("Why not, he was doing it already and would continue to do so"). I once asked him if he wanted to sell the Coolidge to me. He said he would be interested but I never pursued it. Perhaps I should have done so!! For the next part of the SS President Coolidge story, diving the wreck, click here.